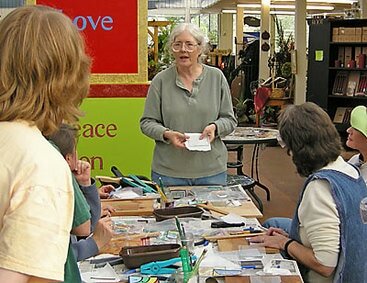 Increase your collection, your skills, and your knowledge by taking (or giving) a class. 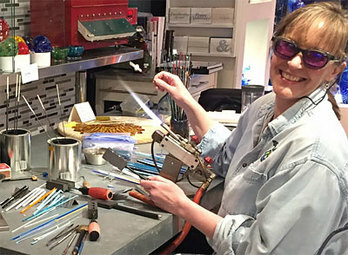 Even if you just want to sit back and admire the work of others or if you think you aren't creative, having first-hand understanding of the process will increase your appreciation of the full range of finished glasswork. You might even discover a new creative outlet or a technique that applies to your own work in a very different medium. 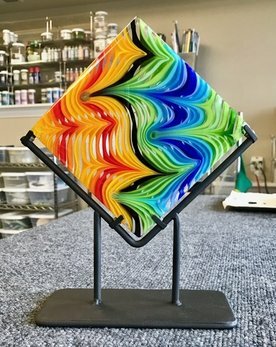 Cut a complex piece out of glass. The wonder of snapping their first score with their bare hands is something most glass workers remember clearly (score is the term used for the scratch made to show glass where you want it to break, you don't really cut the glass with a glass cutter). Cutting straight lines is fairly easy. Cutting curves makes it more apparent that you can't force glass: you guide it to do what it is going to do anyway, which is break. Blow an ornament or other simple object. You'll have a new appreciation of the deft balancing and teamwork of those who dance with hot glass. You'll also understand that this isn't the instant gratification it appears. Getting good results requires lots of practice and teamwork. In addition you have to wait for it to anneal overnight or longer before you can take it home (annealing is the process of slow cooling that keeps the piece from spontaneously shattering due to internal tension if cooled too quickly). 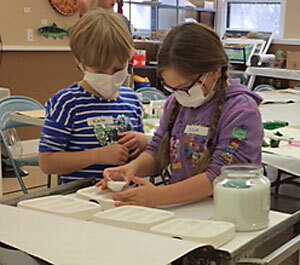 Studios differ widely in price and in the amount of "hands-on" students get to experience. If this is a concern, ask what is included before registering for a class. 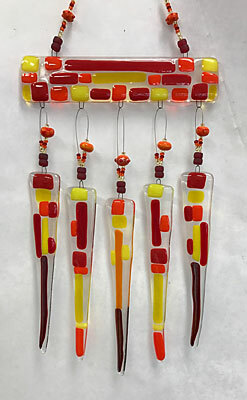 Form a bead or other flame-worked piece. This is the more individual way to work with hot glass but still requires annealing before it is finished. 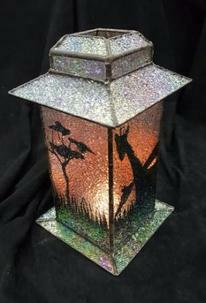 Make an image on glass by paint, frit manipulation, etching, sandblasting etc. 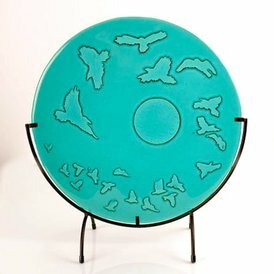 Even if you don't think of yourself as a representational artist these sorts of techniques can enhance glasswork in seemingly very different arenas. 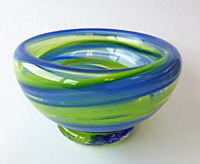 Ask glass artists who they recommend or look at our class list. If you want more after you have mastered the basics, look for an artist who uses a technique you want to learn and ask if they teach. If you want a short, efficient introduction you probably want someone who has already taught the class a couple of times. On the other hand, exploring a new technique with someone only a few steps ahead of you can be an interesting interactive journey of great value for both of you. 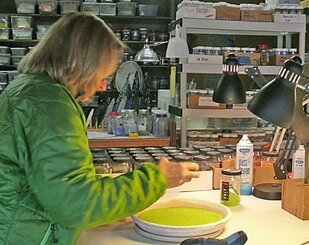 Kathy Johnson prepares to show students how to make a bead at Glass Expressions in Burien WA. 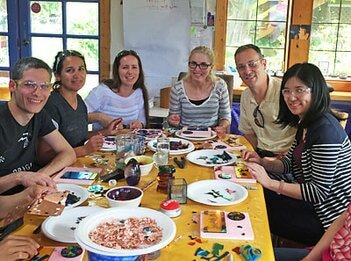 Try a basic fusing class. A kiln and all the associated "furniture" for fusing and kiln-working is an order of magnitude more expensive than working with flat glass. Most places which teach fusing and kilnwork will fire pieces for you so you can experiment before leaping in with the whole checkbook. Join a glass blowing team. Many studios who teach will be glad to work with you individually once you've mastered the basics. 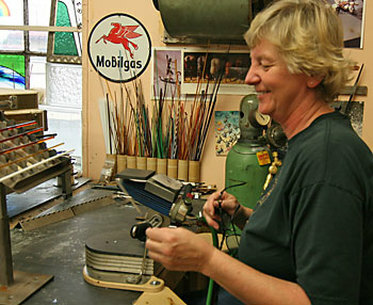 Eventually you and fellow glass friends can rent studio time and trade the design-lead around. Rent torch time. If you aren't ready to set up a fireproof bench and a torch at home a few places around will rent torch time (a resources list will be on the classes page by the next issue: please send us info.). 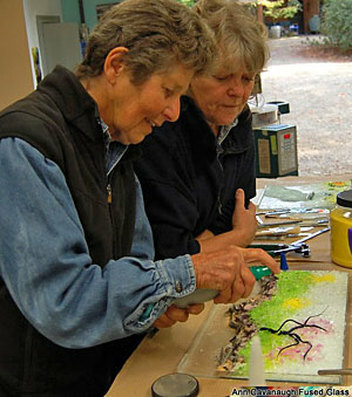 A Seattle Mosaic Arts member gets tips on grouting. Joining a membership program is a good way to deal with a lack of space to be messy at home. 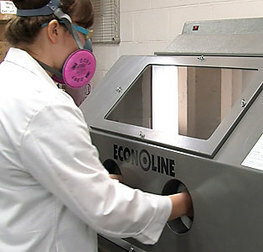 Sandblasting at the Bullseye Resource Center in Portland. For a fee you can access the full cold-working shop at certain times once you've had instruction in the use of the equipment. Students widen your vision. You often learn as much from your students as they do from you and your work gets even better. If you have qualms about creating more competition by teaching consider teaching what you have done instead of what you are currently working on. Personally I find my students are my best customers: once they understand what is involved in my process they understand what a bargain my finished pieces are. Many teachers I spoke with agreed. Remember what it felt like to be a beginner. What were your fears? What caused you problems? How would you have progressed in hindsight? Organize: The most common comment I got when asking about good classes was that the instructor broke the process down into achievable steps and gave useful feedback without demanding perfection. Write it down for them. Doing a hands-on project and having to stop and write things down is very difficult. A thorough handout helps immensely, especially in areas where details matter like fusing schedules or mold mixes. Don't forget the advertising potential: put your name and contact info on every page so they can recommend you to their friends, buy finished product or sign up for additional classes (and if it gets copied, you get the credit). Plan a project that can be taken home as a physical token of achievement. We learned the pleasure of this in kindergarten. Finished product isn't quite as important with more advanced students who have a structure of experience on which to hang your information. 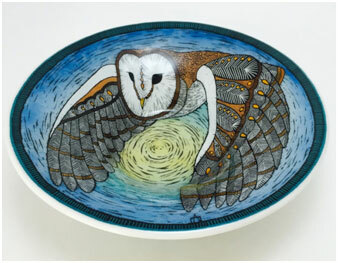 They can get a lot out of a demo or detailed exploration of a particular facet of a process without a finished take-home piece if it means squeezing in more information instead of kiln time. Let students add their own touches to the project but keep it within bounds so they learn what you are teaching within the time allotted. For my beginning class I use set patterns to give experience with cutting specific kinds of curves but they can choose any color and texture of glass. Keep them together. Come up with options to slow down the fast ones while the others catch up. Consider having an assistant to help with this if you have a large class. Support the glass community: buy instead of copying. Once you've got an understanding of a teacher's process, make your work your own. If you really like someone's work, buy it so they are encouraged to make more and will continue sharing their skills. Glass work is ancient but, due to secrecy, many techniques were lost and rediscovered more than once. By sharing and encouraging each other we can assure that skills and techniques are built upon rather than lost and the community is enhanced by the new art that becomes possible. 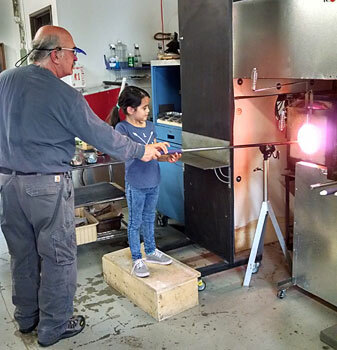 Chris Heilman instructs a beginning glass blower at Renton Art & Glass studio. Chris also enjoys the challenge of teaching glass blowing to people with special needs if you know someone who would appreciate that extra attention and flexibility. 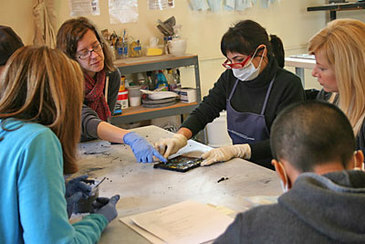 Steph Mader's student prepares a piece for the kiln in an erosion glass class at Steph's studio on Whidbey Island. To help you to realize the wide range of possibilities we've tried to show instructors in many places and situations beyond the well known (and rightly so) Pilchuck Glass School in Stanwood WA, Schack Art Center in Everett WA, Pratt Fine Art Center in Seattle WA, and Bullseye Glass in Portland OR. Be sure to look at their classes too. In keeping with the theme of this issue, these are examples of project photos for upcoming classes rather than really new work. Take a class and make your own, send us a photo. (Yes, the kiln reads 1629) Thanks JLS Glass Studio! We all like to look at how others work. Please share your own how-to photo/video essays in this spot for the enlightenment of the community and a bit of free publicity (we're well over 100 subscribers now). Other glass related events will be added to the calendar as we find them (fill out the form at the bottom of the events page to add yours if there are at least 5 glass artists or, if fewer than 5, at least 50% of the work is glass). The next newsletter, "The Glass Tourist", and a travel related coupon will be mailed in June. Where would you send people to explore glass beyond the Tacoma Museum of Glass, Shack Art Center's hot shop visitor window, and the Chihuly Garden and Glass Museum? *The fine print: Class must be paid for but not necessarily taken by April 30th. If there is a separate supply fee it is usually not included in the discount. Coupon can be used only once with any given organization/instructor. One size can’t possibly fit all: due to contracts, special agreements etc. the participating organization/instructor reserves the right to exempt any particular class from the coupon. Please enquire before attempting to redeem the coupon. Coupon is not transferable, can not be combined with any other discount and has no monetary value.